Just ask any homeowner in Houston, and they will agree — the process of moving your home can be quite a stressful experience! Plenty of hard work comes with closing the home you own, let alone selling your old home and moving into your new house at the same time! From coordinating travel arrangements to setting up utilities and your moving company, the whole situation might seem like a looming giant hanging over your head. But never fear, there are solutions available to you home moving adventurers! By thinking things through and planning ahead, the entire process can go much easier. Keep these practical words of advice in mind. If you only remember one rule from this blog, this is the one to take with you. 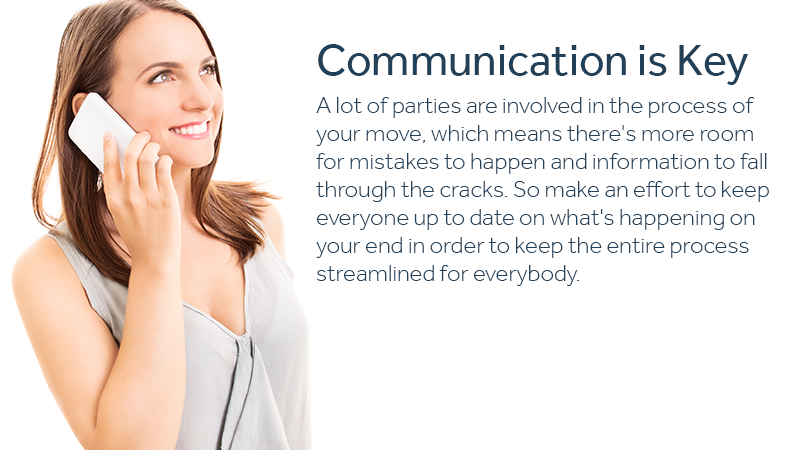 A lot of parties are involved in the process of your move, which means there&apos;s more room for mistakes to happen and information to fall through the cracks. So make an effort to keep everyone up to date on what&apos;s happening on your end in order to keep the entire process streamlined for everybody. This communication often involves lawyers, real estate agents, banks, buyers, sellers, the moving company, utility companies and, in some circumstances, tenants, landlords, cleaning companies and builders. It&apos;s much easier to plan out your days and times at least a month in advance and preferably two or more. You wouldn&apos;t want to cram all of your studying the night before the final exam, right? The same logic applies here. If you&apos;ll need to coordinate lodging and travel expenses, book your rooms and rides well ahead of time to avoid ridiculously high rates. Remember, too, that you don&apos;t have to move all your belongings out on the same day as closing day — that&apos;s just crazy! Getting a portable storage unit helps to save both your time and your sanity. During times of change and uncertainty, having extra funds in your bank account is common sense. That way, if any surprise fees come up while finalizing your new home or traveling long distances, you won&apos;t get stuck gouging holes into your pockets. Having a stack of cash with you and carrying a designated credit card while traveling isn&apos;t a bad idea either in case you need to stick it out at the hotel another night or two. Closing and move-out dates are pretty stressful, but you can have peace of mind knowing your belongings are in a good place with Zippy Shell! Our rates are lower than other storage services. See for yourself by getting a free quote! You can contact us anytime, too.